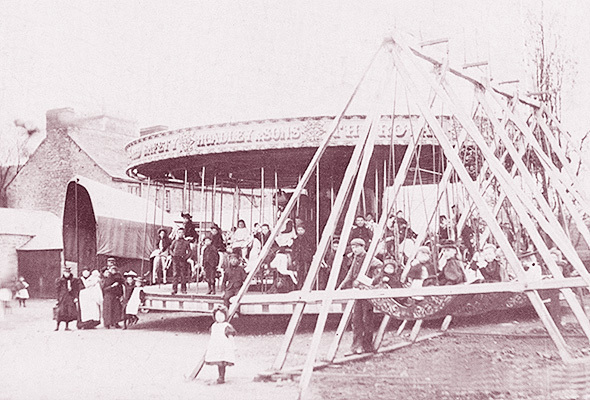 When the circus came to Fleetwood as elsewhere it used to be a very big event. The boys and girls had a day off school and walked out as far as Burn Hall to meet it and watch the grand procession later on. At night attempts would be made to slip unobserved under the canvas of the Big Top. Clearing up after the circus with its elephants, camels and many horses was a Herculean task. Hoadley and Sons made stops at selected Fylde villages including Fleetwood, the swingboats and roundabouts being the most popular items of all. Coconut shies, rolling pennies and shooting at targets came a close second. The wooden horses with red, flaring nostrils were beautifully carved and today, together with fairground engines, are much sought after. The picture from 1912 gives some idea of the primitive caravans of wagons employed in journeying from one pitch to another and suggest a spartan life for those brothers of the road who followed such a calling.